A 36-year career in science led UC Cooperative Extension Integrated Pest Management advisor Pete Goodell to a gratifying conclusion. He found that technical pest management skills are critical, but it's the people skills he has developed over time that were key to bringing about change. Goodell retires June 30 from what he described as a fulfilling and challenging career that he entered by pure happenstance. His role as a researcher, leader and teacher turned out to be the perfect profession for someone with his interests, skills and passion. Unable to find a job in forestry after completing an ecology degree at California State University, San Francisco, Goodell answered an ad he saw on a UC Berkeley bulletin board seeking staff to collect insect samples in a hot Los Baños cotton field. The job opened the door into the world of agricultural entomology, a scientific field that impacts the most basic of human endeavors, food production. Captivated by the opportunity to make a difference, Goodell continued his education at UC Riverside, where he studied nematology, entomology and plant pathology, earning masters' and doctorate degrees. Just as his education wound down in the early 1980s, there were rumblings in the California State Legislature about the implementation of new regulations aimed at reducing pesticide use. 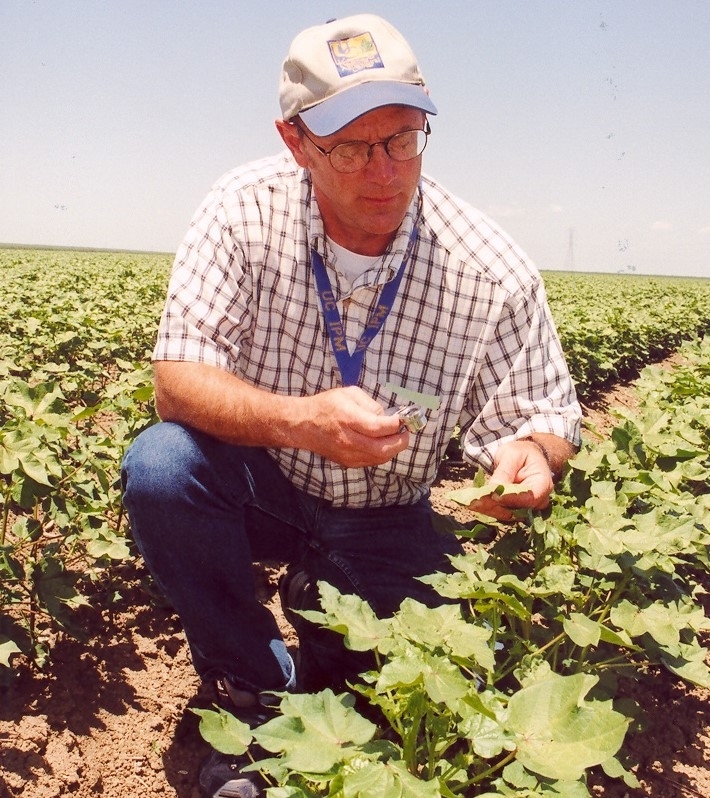 Retiring UC IPM entomologist Pete Goodell in a cotton field. With state funding, the University of California created the Statewide Integrated Pest Management Project (UC IPM) to help develop feasible alternatives to pesticide use. UC IPM hired a team of academics to conduct the research, write management guidelines and share the information with California farmers. Goodell is the last of the original team, which has grown to now include 10 IPM advisors, 4 affiliated advisors, an affiliated specialist, and 22 staff members. Jim Farrar, director of the Statewide UC IPM Program, attributed a large part the program's success to Goodell's contributions. “Pete delivered innovative IPM programs ranging from technical pest sampling strategies to the social science of how people learn and adopt new pest management techniques,” Farrar said. In the early days, the program focused on producing IPM manuals for the crops that were the highest pesticide users. Teams were established to research, collect and deliver best practices for alfalfa, grapes, walnuts, almonds, rice, cotton, tomatoes and citrus pest management. “In the UC IPM program we worked together across disciplines, so we got a lot done,” Goodell said. Today a library of integrated pest management books, leaflets, training resources, websites and blogs deliver UC's best information on managing pests using safe and effective techniques and strategies that protect people and the environment. One of the concepts that has defined his career is regional integrated pest management, which pushes the management of pests beyond the boundaries of individual farms. Goodell worked closely with farmers in the Tulare Lake basin to implement a regional IPM management system. Goodell brought together 10 growers, each managing several hundred thousand acres of farmland, to collaborate on the Lygus bug problem in cotton. “Lygus bugs build up in safflower. When the safflower is harvested, all the bugs move into cotton and you have to spray pesticides,” Goodell said. Safflower is an important part of the crop rotation system, so Goodell got the farmers together to decide on a management scheme. The coordination was a complex process. “I was privileged to work with such a motivated and engaged community of farmers,” Goodell said. The same kind of regional management was proposed for a group of growers near Firebaugh, but Goodell found it nearly impossible. Goodell has applied for emeritus status to continue his work in collaborative entomology during retirement. He and his colleagues plan to bring together a diverse group of Californians to enhance understanding of pests, pesticides, and integrated pest management. In retirement, Goodell will also pursue his passion for the Great Outdoors. He plans to hike the John Muir Trail one segment at a time, and visit the National Parks in the western United States in style, by staying at historical lodges. Getting reservations won't be a problem. “We have a very open calendar,” Goodell said. For me, Pete continues to be a strong mentor, guiding by principle and leading by example. He taught me to 'tell it how it is' and to hold integrity, both scientific and personal in nature, above all else. I believe the US News & World Report got it right by naming him 'Indispensable'. I hope he'll accept joiners on his Muir Trail segments; I'd love to cover some miles with him, my healing Achilles tendon willing. Pete represents all that is good about Cooperative Extension. He is an excellent scientist in his own right, but has that unique quality that can make a scientist an effective extension educator as well. He is also an effective leader, and stepped up countless times to provide vision and guidance not only for the UCIPM project, but for the IPM community at large. He always managed to do this with his typically quiet and humble demeanor. It was my privilege to work with Pete and the dedicated members of the the UCIPM project from its inception. In many ways, UCIPM helped set the standard for how a 'square peg' with new and different ideas and structure could operate effectively within the changing universe and expectations of the University of California's agricultural programs during the last 3+ decades. This success would not have been possible without Pete's omnipresence on campus, in the counties, and in the community. In addition to his excellence in entomology, Pete has long been one of those rare biological/natural scientists who not only understands the important value of social sciences in agricultural research and extension work, but has also actively promoted collaboration with social sciences in his own work. On numerous occasions over the last decades, he conceived of and hosted collaborative workshops with experts in learning and teaching methodologies and theories of adoption of practices, to the benefit of many colleagues at ANR. This is the kind of extension leader we need more of!